The Centers for Disease Control and Prevention (CDC) estimates that 62% – 88% of sharps injuries can be prevented simply by using safer medical devices. Researchers should always consider how to safely handle sharps and identify procedures and/or scenarios when a sharps injury could occur. By identifying when a sharps injury can occur, planned activities can be evaluated, reducing the likelihood of a sharps-related injury. What is the proper disposal method for sharps? Sharps disposal is extremely important. Lab personnel, as well as non-laboratory workers, can be injured by sharps that are disposed of improperly. For example, leaving a razor blade on a laboratory bench or discarding syringes with needles in the regular trash or recycling present a risk to housekeeping personnel that are responsible for cleaning these areas. Sharps must be safeguarded when not in use and placed in a sharps container for disposal. REMINDER: needles should not be recapped. 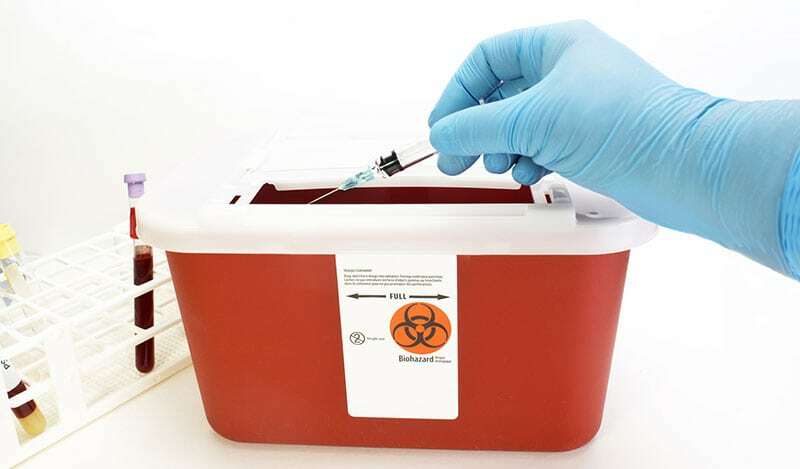 Are there specific requirements for sharps containers? When and how should I dispose of sharps containers? Sharps containers must not be filled more than 3/4ths full. Most sharps containers come marked with a fill line that indicates when the container is considered full. 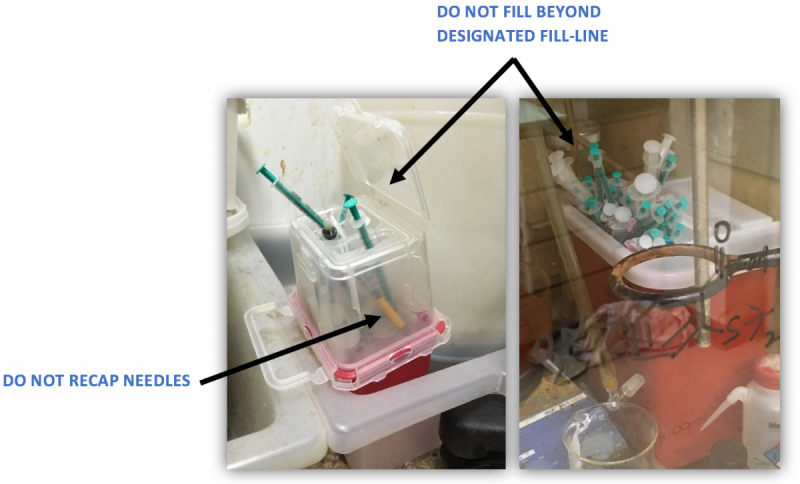 Once contents reach the fill line, dispose of the sharps container by closing it securely. The sharps container should then be placed inside of a Stericycle box. Are there any safe needle device options in addition to the traditional syringe? Labs are encouraged to evaluate and purchase safer sharps devices as a method to reduce sharps injuries. A safer sharps device can prevent an injury by covering or isolating the sharp directly after use. There are safety scalpels, self-sheathing needles, retractable needles, and blunt tip needles. These items are designed to reduce the likelihood of sharps injuries. Are there any other tips on preventing sharps injuries in the lab? Keep sharps pointed away from the user and others. Avoid hand-to-hand passage of sharps. Do not walk around with an uncapped needle, scalpel, or razor blade. Check your work area for sharps before leaving (bench tops, fume hoods, biological safety cabinets). Know what to do in the event of a sharps-related injury. Reducing the risk of injury in the workplace is the responsibility of users by ensuring that sharps are handled appropriately, stored correctly, and disposed of properly. Safety is everyone’s responsibility. For additional information on sharps safety, review the “SAFE USE OF SHARPS GUIDELINES” available in the Forms/Documents section of the EHSO website (http://www.ehso.emory.edu/). This entry was posted in EHSO and tagged accidents, bbp, biosafety, Bloodborne Pathogen Standard, CDC, disposal, ehso, injuries, lab rat newsletter, lab safety, labs, needles, OSHA, razor blade, sharps safety, Stericycle, syringe. Bookmark the permalink. Trackbacks are closed, but you can post a comment. I was told by a colleague that we are not allowed to have needles separated from the syringes in the sharps containers in addition to the needles not being recapped. Can you let me know if that is valid? We are drawing blood and the first rule of drawing blood is to remove the needle prior to putting the blood into the appropriate vials to prevent hemolysis and yield more accurate blood results.